The root cause can be traced back to leg swelling from CVI. Fatigued legs are common amongst those with chronic venous insufficiency (CVI). As the name suggests, individuals with fatigued legs experience a tired, heavy feeling in their lower extremities. The symptom tends to feel worse after sitting or standing for long periods of time, and may be accompanied by leg pain, swelling and other symptoms of CVI. Leg fatigue is the result of leg swelling due to CVI. Swelling in the legs indicates that water has accumulated between the cells of the soft tissues, making the limb feel heavy and tired. 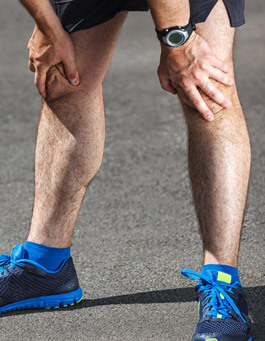 The pooling of low-oxygen blood that’s high in lactic acid and end-metabolites is also to blame for leg fatigue. Without nutrient-rich blood, the muscles in the affected area become tired more easily. Women over the age of 50 are most at risk for developing chronic venous insufficiency, as are individuals who spend majority of their time on their feet, like EMS workers, food service employees, teachers and retailers. High blood pressure, obesity, a highly sedentary lifestyle, and family history of CVI are also contributing factors. For fast relief of fatigued legs, individuals can lie down and elevate their legs for 15 to 30 minutes, several times a day to help drain pooling blood and alleviate pressure. Compression stockings may also be worn to encourage proper blood flow and prevent pooling, but ultimately, the underlying CVI must be addressed. Endovenous radiofrequency ablation (RFA), ambulatory phlebectomy and ultrasound guided sclerotherapy are minimally invasive outpatient procedures highly effective in the treatment of chronic venous insufficiency and associated symptoms like leg fatigue. If you believe you may be experiencing leg fatigue related to CVI, call today and schedule a consultation to learn more about the best treatment options for you.